One of the most prominent intersections in Ferguson, MO has lately become notorious. CVS is mining the St. Louis area, and as they require being near an existing Walgreens, they want to move into the intersection of Hereford and North Florissant, on the spot of the now-vacant Sinclair gas station (shown above). The issue is covered in depth here at NOCO StL, and that post also includes comments that capture the tone of the debate. 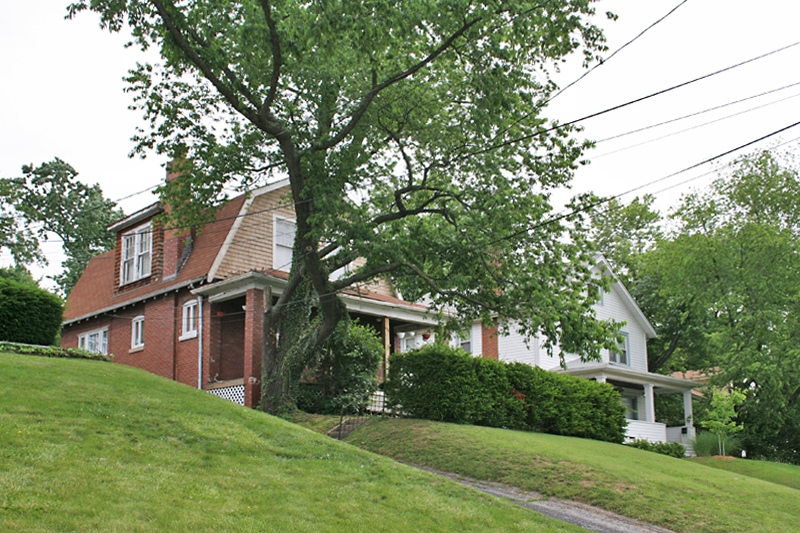 In essence, CVS wants to buy and tear down 8 homes and receive a 5-year TIF in order to build a new store on the northeast corner of a desirable intersection, and have been working on procuring the homes and advancing the plans since spring of 2009. 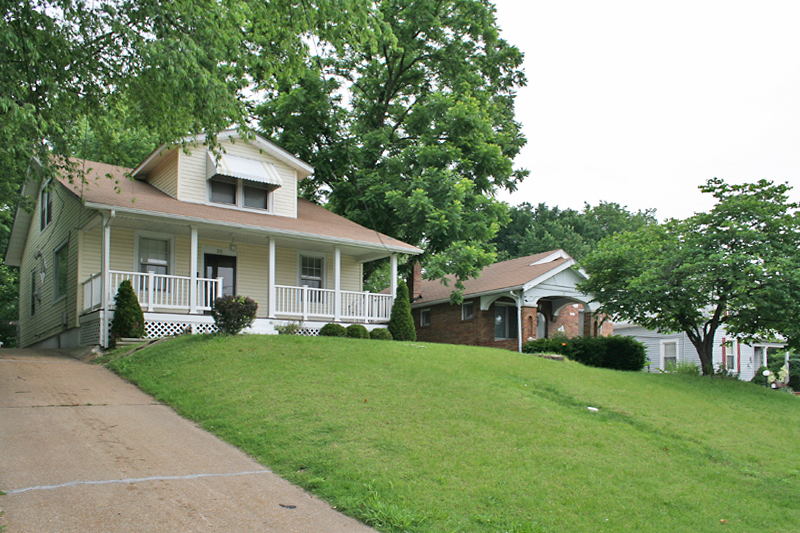 Ferguson neighborhood associations did not learn of these plans until September 2009. It’s become a case of who in Ferguson City Hall knew of these plans (and when did they know it), and were they purposely trying to usher in this development without public discourse? The group Preserve Our Ferguson Neighborhood’s concisely explains why they are opposed to the plan here, and note that they are not opposed to CVS coming to Ferguson, just opposed to this plan. The photo above – and the next two that follow – are photos I took in May 2007 as part of a personal photographic survey of Hereford/Chambers Road from N. Florissant east to Halls Ferry Road (I hope to document straight through to Riverview Dr.). 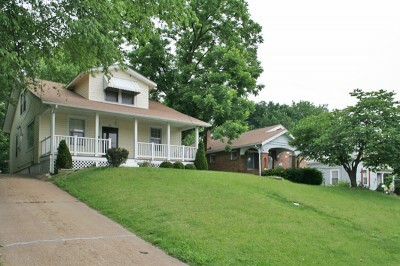 These homes atop the hill on the northside of Hereford are a long-standing, iconic representation of Ferguson. Even though everything to the southwest of them long ago turned commercial, these houses remained. Meaning, that even during the boom years of Ferguson’s mid-century development, planners left this stretch of homes alone. 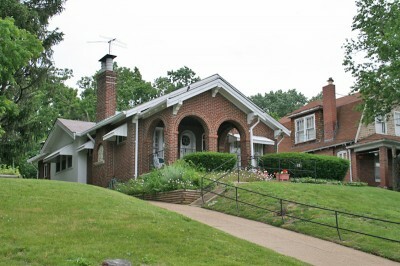 From 1945 – 1970, the clear delineation of commercial and residential in Ferguson is what made it so desirable for St. Louis city dwellers looking to relocate to the suburbs, and the long-standing respect for that pattern is a huge contributor to the renaissance Ferguson is now experiencing. There is a growing and tangible St. Louis population reclaiming both our city neighborhoods and inner-ring suburbs because of the distinct flavor (and existing infrastructures) they retain. It is an organic reaction against anonymous homogenization that depletes resources and a reclamation of community that is at the core of the human experience. Ferguson is quickly becoming a poster child for inner-ring possibility, which is a responsible balance of respecting the past while moving forward. From casual observation of how CVS has grown in the Midwest, it is clear that there is a corporate game plan that requires their stores to be in close proximity to a Walgreens. I’m not debating their strategy – it must work for them or they wouldn’t insist upon it – but I am noting that there stubborn adherence to this strategy finds them offering lame excuses when faced with community opposition. For instance, in the Ferguson situation, the community has suggested other nearby commercial sites that could most likely be had without disrupting residential, and most of these sites are within eyesight of the Walgreens. But CVS corporate responds that there might be a lease restriction on the site, and they want to work only on the Sinclair site they have been working on for almost a year. The City of Ferguson may have already offered them a 5-year TIF, and CVS might also get a Brownfield tax credit for building on the site of a gas station. Note that Ferguson can extend TIF to most any location it desires, so that’s not a crucial factor for CVS staying put with the Sinclair Plan. But one thing is very clear from our brief history of the company in St. Louis: they want empty commercial and seemingly expendable residential buildings near a Walgreens because dealing with an existing corporation can get tricky. For instance, their Ferguson plan procures 8 occupied homes, but spares the Little Caesar’s pizza building at the northern end of the block on N. Florissant. It is cheaper to pay above-market price for private homes than wrangle with an existing business that full-well knows the rules of the real estate game. This may be why the Aaron Rents site mentioned as another possible location for CVS at the same intersection was immediately dismissed; who wants to tangle with evicting a retail chain when the goal is to get in, get what you need and seal the deal as quickly as possible? From the CVS perspective, these location strategies are logical, and it worked perfectly for them at the intersection of Gravois and Hampton in South St. Louis City, the former site of a vacant Amoco station that also required 3 homes to be demolished. The Ferguson site is a repetition of that same game plan, so why not? But there’s another example that Ferguson needs to keep in mind: the failed attempt for a CVS at Lindell and Sarah in the Central West End. 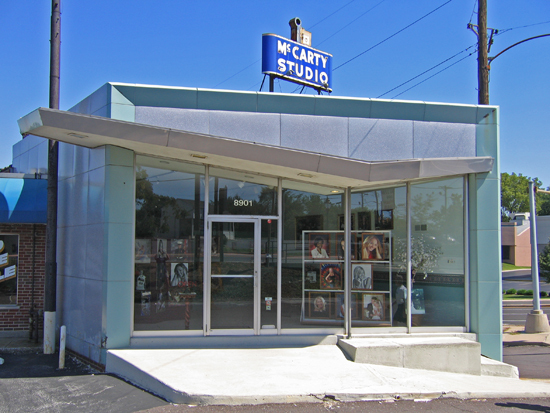 Yes, the plan took place over vacant commercial buildings, but this property was not in eyesight of the existing Walgreens, just a few blocks east on the same side of the street. So, not the most ideal way to meet the corporate mandate, but still a viable property on a valuable street. But the next problem was persistent community opposition. In general, the majority of residents affected were not opposing the store being there, but rather the layout and design of the store. CVS played ball for one inning with some design modifications, but residents still weren’t satisfied and asked for further revisions. Without fanfare, CVS took their ball and left the game, and the CWE CVS plan was abandoned. Simply because a corporation with deep pockets says it should be so does not make it fait accompli, especially within a proud community committed to the safe-keeping of their town’s present and future. It is easy to understand the need to increase the Ferguson tax base, and this is classically accomplished in two ways: more residents and more business. It is a delicate balance, and Ferguson is once again facing the hefty kid on the playground who wants to plop down on the other end of their seesaw. The important message of this “controversy” is that Ferguson residents are expecting transparency and fair negotiations about developments that will produce the most good for their city, and that is the sign of a community with healthy self-esteem and optimism about their future potential. Ferguson’s heartbeat is gaining strength, and it is now healthy enough to fight for a fair deal. There is valid concern about what to do with the Sinclair site if the CVS deal should fall through. Size-wise, old gas station plots can be problematic if you’re thinking inside the retail box. Though, considering the current revitalization in the heart of Downtown Ferguson, extending that line of thought a few blocks up to Hereford is not a stretch of the imagination. 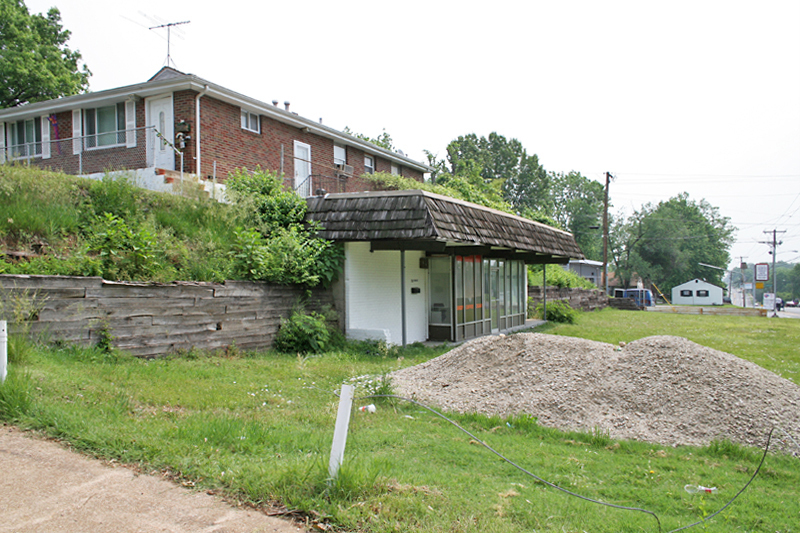 And when it comes to revitalizing odd-shaped, vacant gas station sites in Ferguson, I do need to point out the photo above, also taken in May 2007. This is at Ames Pl. and (Hereford turns into) Chambers Road, less than a mile east of the Sinclair intersection. 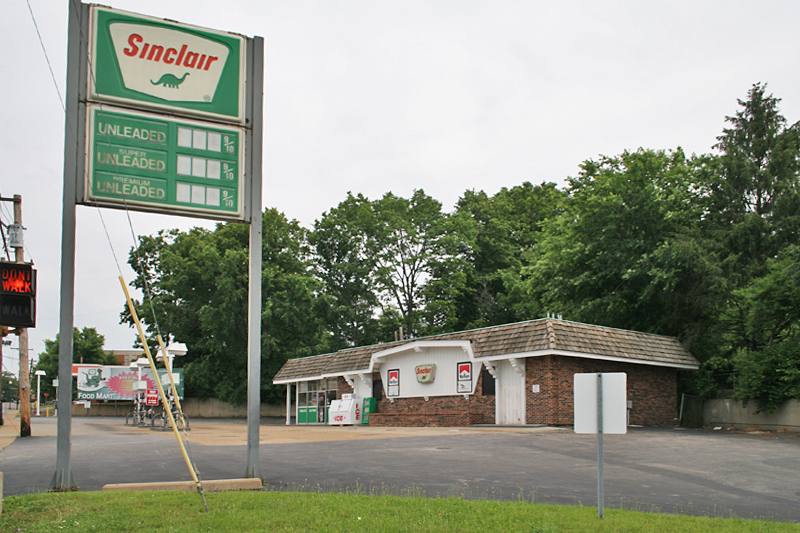 I once lived within walking distance of this former gas station, and was always intrigued by it because it appeared to be growing out of the side of a hill. Plus, those people above it could walk out their side door and onto the gas station roof, if they wanted to (and I really wanted to). The building is short and narrow, while the lot is long but very narrow. So when the gas station finally folded many a year ago, it sat in this forlorn, vacant state. The asphalt was removed, and once the grass grew in, it really looked odd, like a cedar and glass carbuncle growing out of the greenery. But the last time I drove by, the site was back in use as a used car lot, which was a pleasant shock because I thought that plot of land and the building was a goner. Instead, against all odds, it’s reborn! I am not at all suggesting that the Sinclair site should become a used car lot. I am just pointing out that even the oddest, and seemingly hopeless sites can find another life when it’s in a community that works together to make such things possible.